Buck Knives Force boasts the latest in tactical design and innovation. An ultra-fast and smooth opening with the flipper works so quickly, you would think it's an assisted opener. Using an oversized liner lock for and stainless steel frame, it provides ultimate strength and durability. When faced with a critical situation, the Vantage® Force is prepared to protect in a moments notice. Buck Knives Force boasts the latest in tactical design and innovation. An ultra-fast and smooth opening with the flipper works so quickly, you would think it&apos;s an assisted opener. Using an oversized liner lock for and stainless steel frame, it provides ultimate strength and durability. When faced with a critical situation, the Vantage® Force is prepared to protect in a moments notice. 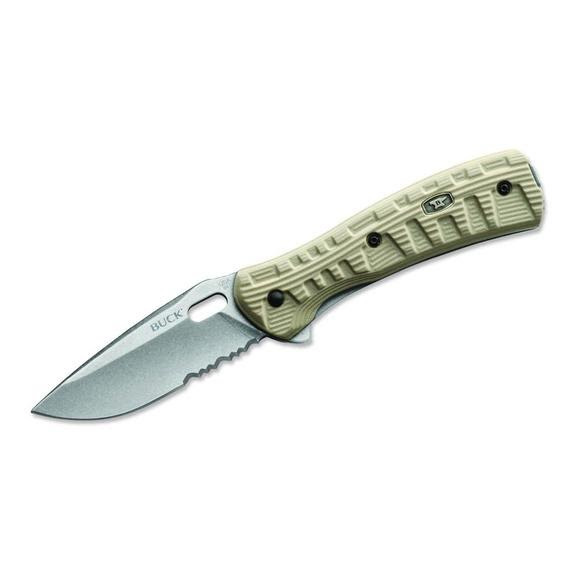 With a stonewashed, non-reflective S30V blade and heavy duty Desert Tan G-10 handle, this knife will meet the intended need for professionals. We consider this the absolute best blade steel available, and it is made in America. S30V contains carbon as well as high amounts of Chromium, Molybdenum and Vanadium. This steel combines fantastic edge retention and high ductility combined with corrosion resistance. Double-tempered - it can be hardened to a Rockwell hardness of Rc 59.5-61. However, it is difficult to resharpen yourself, but we do offer sharpening services for a nominal fee.